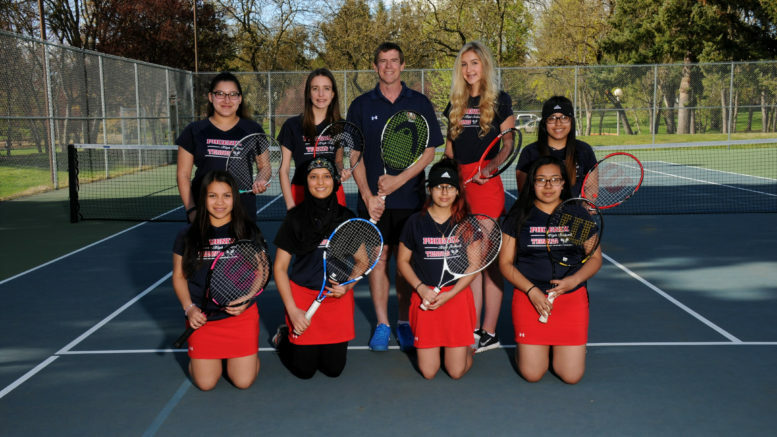 The girls tennis and equestrian teams are both totally different sports but the one thing they have in common is, its all about the girl power. Both teams have worked great this season to show spirit for Phoenix High School. These teams may be the smallest sports team at Phoenix but they both have achieved great success this season. The two teams have been pushing hard and hopefully all the members will make it to state. Tennis has had multiple matches over the the last month. Doubles and singles teams have both showed a lot of improvement from when they first started. There have been wins and loses, but they keep trying their best to win districts and go to state. The number one doubles team, Miranda Perez and Alejandra Camacho fought really hard to win the first round in districts with a score of 6-2 and 6-1 but didn’t make it after the second round. While the newcomers Celeste Maclenion and Elaina Salcedo have come really close to a win and unfortunately didn’t win at districts they always try their hardest to be the best doubles pair they can be. We asked one of the players, Amna Hoorain, how many games have you won and she responded with “Our focus isn’t on winning its more on experience”. On the other hand our only singles player Bella Hoye did not win in districts but won many other matches before. Good job to all the girls who participated in a wonderful season of tennis. The equestrian team really shows school spirit out in the arena even though the team is not the biggest. Riley Hayes and Ashlee Day are very competitive when it comes to the sport they love. They traveled to state in Redmond Oregon on Thursday May 10th. Both the girls did their best and had a great season. When asked, Why did you join Equestrian? Both girls had very thoughtful responses. Riley said that “ it’s a way to be competitive with your horse and represent your school” and Ashley said that it’s a way “to be connected to your school”. The girls placed 3rd for drill in one of their matches and Riley Hayes placed 2nd in western. Over all they got really high places and had a great time through the whole season. If you are interested in signing up for either of the sports you can talk to the front office or the couches. The tennis coach is guy Tauer and the equestrian coach is Mrs. Hayes who works at Talent Middle School. We will be very excited if you decide to join next year! Overall both teams have been pushing there way to the finish line and will hopefully make some more wins at the upcoming events. We are all very proud of how hard they try on the small teams and how much extra work they have to do. Being on a sport and keeping up with grades is not the easiest thing but theses girls push through to make Phoenix High Schools name stand tall. Congratulations to all the members who will make it to state! Be the first to comment on "Girl Power"